"Combine 80 tents, an oak grove, and two dilapidated cabins, and you have the Smoketown Hospital, perhaps the most well known of all the Antietam hospitals and the longest-lasting." Our great feature is the assistance of Miss Hall... she has two large tents under her charge, and two good cooks to assist her... The number of patients now in the hospital is one hundred and ninety-eight. This number will be increased, with patients from other hospitals, in a few days to about three hundred. ...Lem Gentry, an Indiana newspaper correspondent, quoted by John Nelson. From the William Smith Ely collection at Edward G. Miner Library, University of Rochester Medical Center. 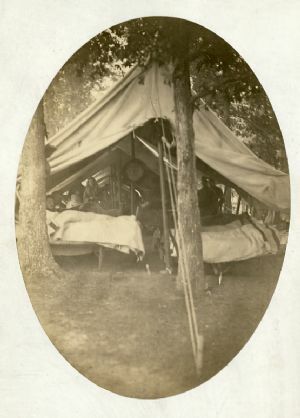 Dr Ely served in the Antietam Hospital at Smoketown from 1862 to 1863.